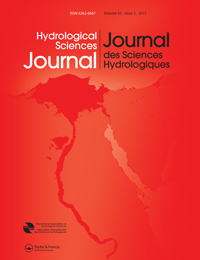 The annual subscription is now due for Volume 63 (2018) of Hydrological Sciences Journal. Volume 63 remains at 16 issues but we have managed to keep the annual subscription rate the same. Volume 63 will continue to publish a special series of invited opinion papers directly linked to the IAHS "Panta Rhei" initiative that will be collated in the online virtual special series. Discussions and replies on these opinion papers wll also be published. In July 2017 we announced the continued rise in Impact Factor for HSJ. The Impact Factor is 2.222 with a 5-Year Impact Factor of 2.372 (©2017 Thomson Reuters, 2016 Journal Citation Reports®). Following the retirement of Mike Acreman, Attilio Castellarin was confirmed as the Editor-in-Chief at the IAHS Scientific Assembly at Port Elizabeth, South Africa, with Demetris Koutsoyiannis the Outgoing Editor-in-Chief and Ross Woods as the most recent Editor and a new Editor will be appointed in due course. The number of Associate Editors has risen to 41. Special journal subscription rates are available to IAHS Members: £27.00 for a personal online subscription, and £48.00 for a personal online + print subscription (£32.40 and £53.40, respectively for EU members, inclusive of VAT). You can renew your membership online via the IAHS website at https://iahs.info/Members-Area/hsj-link.do or contact the IAHS office via phone +44 1491 692515, fax +44 1491 692448 or email info@iahs.co.uk.